A great deal of stress is placed into planning the ideal wedding, whether it involves deciding upon the ceremonies, the perfect wedding invites, rituals, venues, etc. 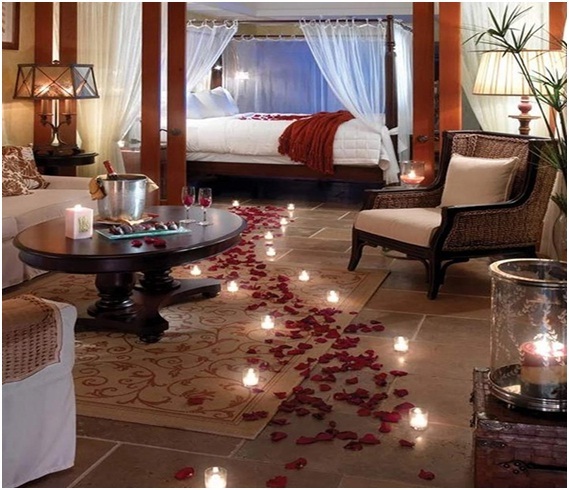 One particular aspect given much consideration is the décor kept for the couple’s room for their wedding night. For all those in search of absolutely ravishing wedding night bedroom décor ideas, the below-mentioned settings could be of much help with successfully executing a gorgeous décor theme. Not only are swans widely known for their sheer beauty and grace, but are also considered as being sacred to the Greek. The association was made following the swan labeled as being sacred by Venus; the Greek goddess of love. It is most common to find a set of white towels folded immaculately to imitate the shape of swans amidst hearts created from red-colored rose petals to best bring out a romantic touch to the ornaments. Mastering the art of effortlessly transforming towels into immaculate swans may not be everyone’s forte, because of which opting for candle based décor is the safest, yet also among the most equally stunning décor one can choose for the newlywed couple’s first night together after marriage. The natural glow of the fire lights up the room in a subtle glow; the effect can further be enhanced by adding additional exotic accessories such as sculpted glasses and even lanterns to give a more extravagant look. If the bed has side stands that can be used to create a canopy of flowers and other associated décor, then opting for the canopy is an excellent choice. The flowers can be merged with white or different light colored desired fabric utilized to be draped around the bed itself. The bedding must be very comfortable. Make sure there are some beauty rest pillows and cushions to go with the flowers. The draping can also help create a canopy effect once wholly drawn around, helping the newlywed couple build somewhat of a cocoon embezzled with exotic flowers on the top. If the bed with the side handles is not available for the canopy of flowers, one can always opt for the classic carpet of rose petals leading to the bed, featuring lit candles on the sides to create a pathway. Both romantic, and simple; the flower carpet is neither taxing on time nor money. Another creative alternative for creating a canopy effect without the need of bed-handles is to create a full-fledged flower chandelier over the bed, with fresh scented flowers draping all over the sides. A canopy of flowers not only looks good but also ensures that the room smells divine; although, it may go overboard with the budget, is worth it if one may be opting for an extravagant outlook of the room. The above mentioned are just some of the basic ideas usually opted for as the décor of the room for the newlywed couples; modifications are always an excellent idea to help with being more creative as well as cater to the liking/ disliking of the couple themselves.